What is the “area rule”? 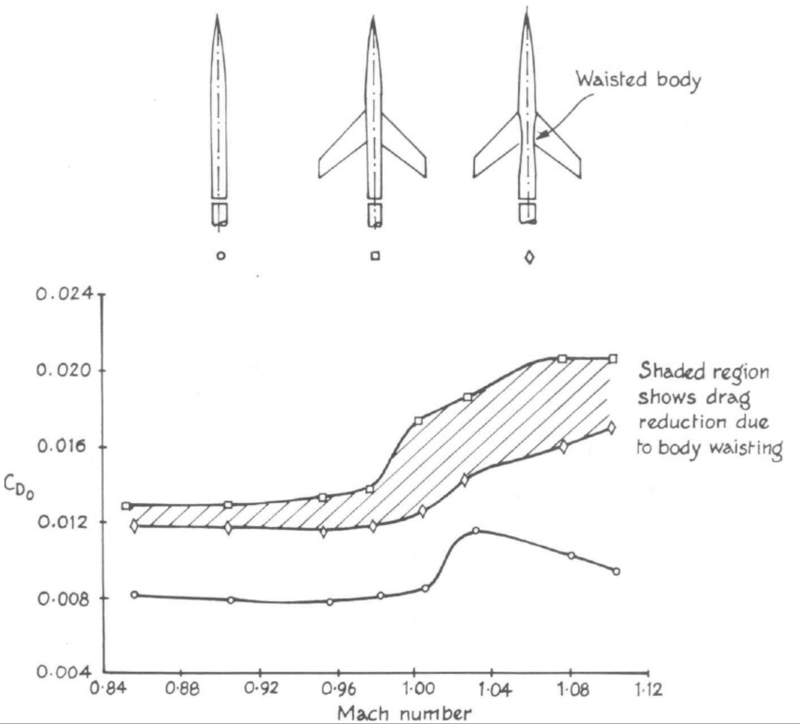 The "area rule" states that the supersonic drag on an aircraft is related to the total area on part of the aircraft. What is the exact definition of the rule? Why does this happen? You might have heard of the elliptical lift distribution which minimizes induced drag for a given span and a given lift. 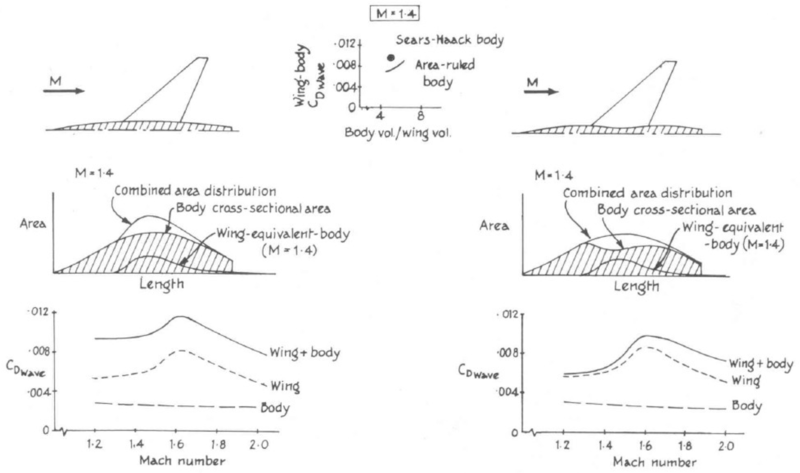 Area ruling is similar, but here it is about the lengthwise distribution of cross-sectional areas of a plane, and it minimizes wave drag at Mach 1. 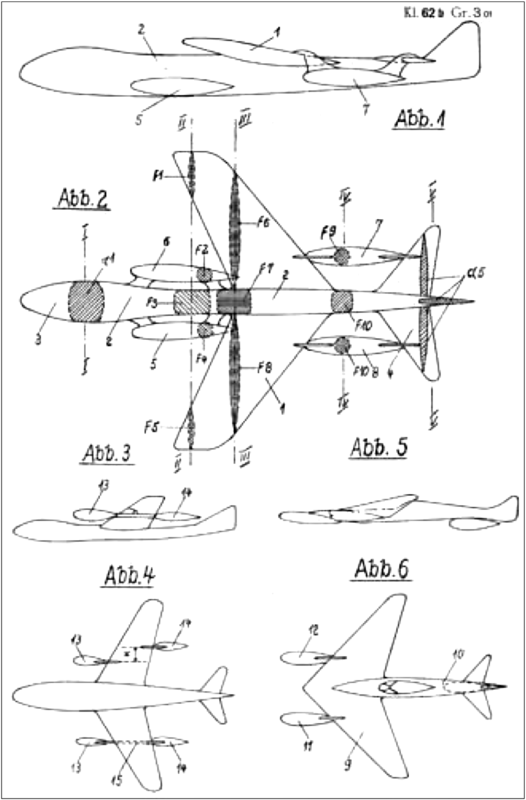 The first picture is from a Junkers patent of 1944: Junkers found out in 1943 that transsonic drag can be minimized by shifting the parts of an airplane around. In this case it was the EF-122, a research project which became the Ju-287. The easiest bodies to shift were the engine nacelles, that is why the end product has such odd engine locations. The drawing shows several shaded cross sections along lines which carry Roman numerals: Plot the sum of all areas along each line over the aircraft's length coordinate, and you get a distribution which must be optimized such that it has the maximum area for the smallest gradients. The next picture shows how those plots look like. This is from a different source, so it shows generic wing-body combinations. On the left is an airplane with a fuselage shaped like a Sears-Haak body. A Sears-Haak body is an optimum shape for the biggest volume with a given wave drag and was discovered by Wolfgang Haak in 1941 and again by William Sears in 1947. The wings come on top and mess up the area distribution by creating a bump in the middle. The right plot shows what can be achieved by taking all parts of the airplane into account. The difference is shown in the small center plot. How this is done: Take away from the fuselage what is added by the wings. The result is a fuselage wich looks like a coke bottle. You can also add Küchenmann bodies; older airliners have plenty of them. Look especially at fuselages like those of the Blackburn Buccaneer, or T-tails like those of the Illjushin Il-62 or the Tupolev Tu-154. Today, things like engine pylons or flap track fairings are used as Küchemann bodies to smoothen out the lengthwise area distribution, and if you look carefully you will see the coke bottle technique on the fuselage around the horizontal tail of many airliners. They don't fly at Mach 1, but close enough that area ruling makes a difference already. In essence, the area rule is a general rule of aircraft design which prohibits abrupt changes in a aircraft's cross-sectional area from one point to another on it's longitudinal axis, since these would create areas of low pressure in the surrounding airflow that would literally hold the aircraft back, reducing it's speed through form drag. The area rule is sometimes referred to as the "supersonic area rule" since it has more significance at transonic and supersonic speeds. Not the answer you're looking for? Browse other questions tagged aircraft-design aerodynamics or ask your own question. Why do super sonic fighter jets have narrow waist? Have any operational aircraft ever used over wing fuel tanks? How to recognise the Tupolev Tu-154, Tu-204, and Tu-334? Can fuel be stored in the anti-shock bodies? How is the area rule applied on airliners like the A380? What are the advantages and disadvantages of a delta wing compared to a swept wing? Why do forward-swept winged fighters have the main wings in the back?  What is the influence of drag on an airliner's block fuel consumption? Is wing sweep needed on supersonic aircraft? What was the first Russian jet designed with the use of area rule? Does a rotating control surface change the wing area? Since when had fighter jet designer stopped caring about Whitcomb's Area Rule?